Спецификация Министерства авиации от мая 1919 года к двухместному гидросамолету-амфибии, способному эксплуатироваться с авианосцев, привела к появлению двух машин: Parnall Puffin и Fairey Pintail. Последний стал первым самолетом, полностью ДальшеMore>>> спроектированным на "Fairey" после окончания Первой мировой войны. Первый из трех прототипов Pintail Mk I поднялся в воздух 7 июля 1920 года, 25 мая 1921 года полетел Pintail Mk II, а 8 ноября 1921 года - Pintail Mk III. Варианты отличались друг от друга длиной фюзеляжа и типом амфибийного шасси, которое доставило немало проблем конструкторам, прежде чем было принято решение делать колеса не убираемыми, а частично утопленными в поплавки. Пока Великобритания не спешила заказывать самолеты, три машины в августе 1923 года заказали японские ВМС. Первый из них выполнил первый полет годом позже, все три самолета поставлены в ноябре 1924 года. В конструкцию самолетов для Японии внесли ряд изменений (в частности был увеличен зазор между крылом и фюзеляжем), эти машины известны как Pintail Mk IV. Всего построили шесть Pintail, но самолет обладал существенным потенциалом, что побудило фирму разработать сухопутный вариант Fairey Fawn, удовлетворявший спецификации 5/21 к биплану для взаимодействия с армейскими частями. Однако проект выполнялся по более поздней спецификации на дневной бомбардировщик. Прототип Fawn выполнил первый полет в марте 1923 года, но испытания выявили необходимость удлинения фюзеляжа. Следующие две машины построили в удлиненном варианте Fawn Mk II. За ними последовали еще две опытные машины, а первый серийный самолет полетел в январе 1924 года. Было заказано 50 серийных Mk II, затем еще две серии общим количеством 20 самолетов Fawn Mk III с моторами Napier Lion V вместо Lion II. Несколько Fawn поздней постройки получили моторы Lion VI с турбонагнетателями, на вооружение строевых частей они не передавались и использовались только для летных испытаний. Fairey Aviation Co., Ltd. (STAND 47) Hayes, Middlesex. As the machine exhibited by this firm has been designed and built to the order of the Air Ministry, we are not at liberty to publish any particulars of this machine other than the following brief notes. The machine is a twin float two-seater tractor seaplane of 40 feet span and 30 feet overall length, adapted to be folded on the water. The engine is a Napier "Lion," 450 h.p., with electric self-starting gear operated from the seat. It is equipped with the Fairey patent Variable Camber Wings which enables the use of loadings of from 115 to 12 lbs. to the square foot. This machine has a further new feature whereby the tail operating gear is interconnected with the camber operating gear so as to give automatic self-adjustment for the shift of the centre of pressure when operating the camber flaps. A further feature of the machine is the system of construction. Instead of the engine, tanks, pilots, passengers, etc., being accommodated in a central fuselage as in the usual type, the machine is built on a vertical steel centre frame or cellule. This is of entirely steel construction. To it are attached the fore part of the fuselage carrying the engine, with radiator, water tanks, piping, etc., complete. The whole of this unit, including the cowling, dismantles by the removal of eight bolts. The same applies to the after half. Chassis, wings, etc., are also rapidly detachable and the machine can be taken down for packing and transport in very small portions. The machine is equipped with the usual Fairey floating system of the two-step type with extended buoyancy chambers aft. It rides tail up on the main floats alone, the tail float being fitted only for purposes of folding the machine on the water. In order to give clear fire aft of the rearward gun no top fin is fitted on the tail, the required fin surface being given by the tail float, rudder and the enlarged size of the fuselage. The machine is slightly staggered in order that in folding the wing tips shall rise clear of the water. 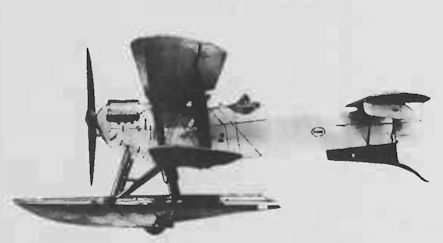 The two main points of interest in the Fairey seaplane are the unit type of construction and the variable camber wings. The engine and its mounting and housing form one unit. 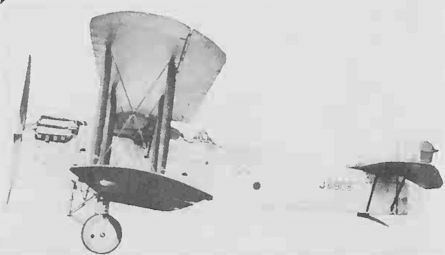 The cockpits, the top plane centre section, main float struts, etc., the second unit, and the rear portion of the tail the third unit. 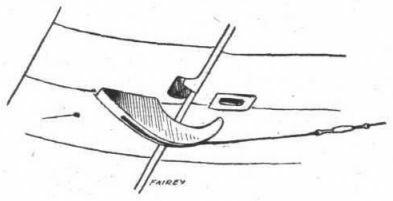 The second feature is the variable camber, which forms a Fairey patent. 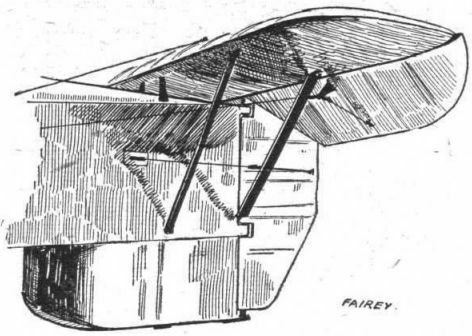 The variation of camber and, incidentally, of incidence, is effected in the Fairey by having the whole trailing portion of the plane hinged along the rear spar. The trailing edge is operated by a wheel mounted in the pilot's cockpit, and can be pulled down or up at will. Of course, the outer portion of the trailing edges is a separate unit, and can move independently of the rest, as an ordinary aileron. 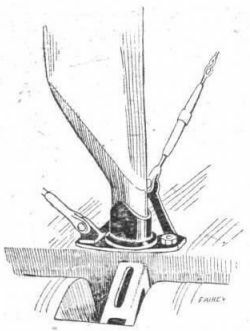 An innovation of this form of variable camber machine is the interconnection of the control wheel for the camber with that of the tail trimming. The two wheels are concentrically mounted in the cockpit and are normally so engaged with one another that a turn of the camber-operating wheel also actuates the trimming tail plate. The relative setting of the two wheels can, however, be altered by means of the smaller of the two wheels, so that any position desired can be obtained. Once this is accomplished, all the controlling can be done with the larger wheel operating both trailing edge and tail plane. A novel feature of the design of the Fairey XXI is the absence of any vertical fin above the tail plane. The object of this is to give a free field of fire to the rear gunner, and it is accomplished by having the tail plane mounted high up, and by making the body unusually deep at the back. The general effect, as regards appearance, is to make the machine somewhat reminiscent of various German seaplanes used during the War. As the machine is designed to a Government specification for the use of the Air Force, we are not at liberty to give particulars of many of the interesting constructional details embodied in the design, much as we should have liked to do so. Fawn состояли на вооружении пяти бомбардировочных частей, дислоцированных в Великобритании - 11-й, 12-й, 100-й, 503-й и 602-й эскадрилий. На фотографии - Fawn Mk II. 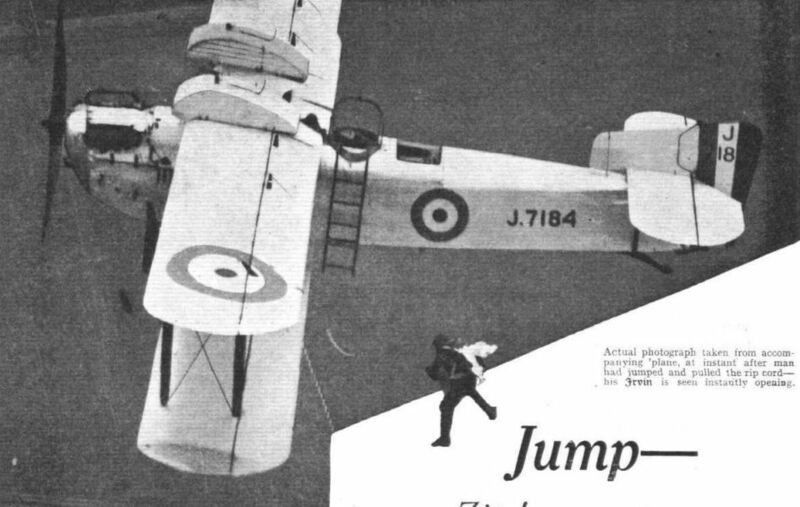 At Croydon "review": The Fairey "Fawn," with Napier "Lion" engine, is a two-seater day-bomber. The petrol tanks are mounted above the top plane. THE FAIREY "FAWN," 450 H.P. NAPIER "LION": A "land" type long-distance reconnaissance machine. Fairey "Fawn" (Napier "Lion"). In the Fairey "Fawn" we have what may be styled the modernised version of the famous "IIID" seaplane - still in use for Fleet Reconnaissance work - but designed as a two-seater long-distance day bomber. Strictly speaking, however, this similarity is confined to general appearance, for it differs from the IIID in several respects. Its distinctive features include the well-known Fairey patented flap gear and a special Oleo undercarriage. At present only two of our bombing squadrons are equipped with "Fawns," as follows :- No. 11 Netheravon, and No. 503 (Special Reserve) Waddington. Actual photograph taken from accompanying 'plane, at instant after man had jumped and pulled the rip cord - his Irvin is seen instantly opening. 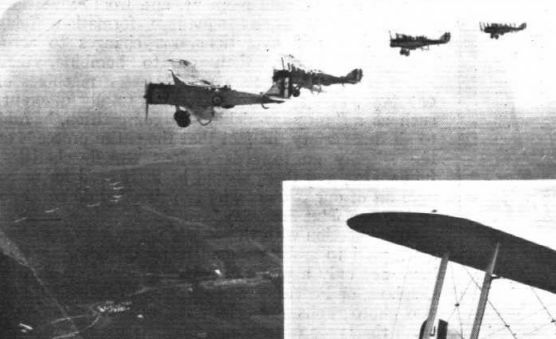 Wing Evolutions by four Bombing Squadrons (18 Fairey "Fawns," and 18 D.H.9a's). On the left the machines changing from "Wing Line Ahead Squdrons Line Abreast" to " Wing in Line Ahead of Squadrons." On the right two Squadrons changing from "Squadron" to "Squadron Mass." MORE GROUP EVOLUTIONS: These were carried out by two Wings of two day-bombing squadrons (Nos .11 and 12, Fairey Fawns, and Nos. 39 and 207, D.H. 9As). 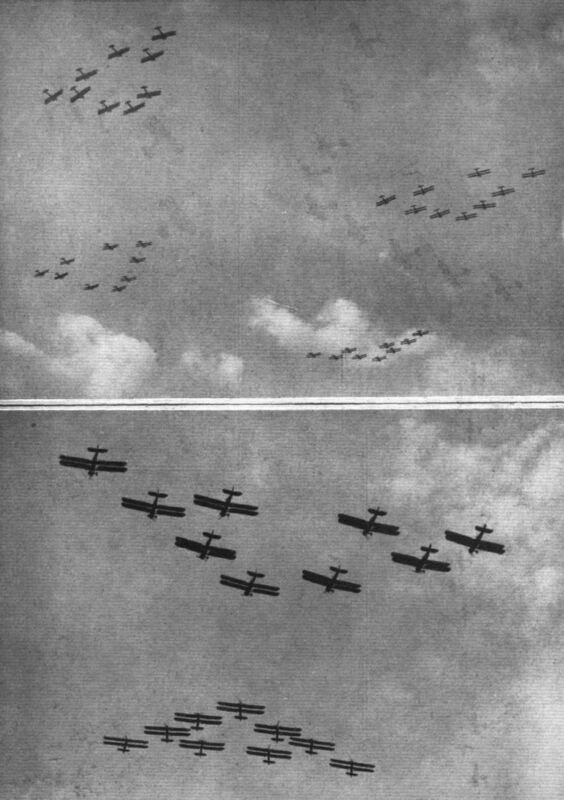 In the top view the four squadrons flying together, and below, flying towards one another. 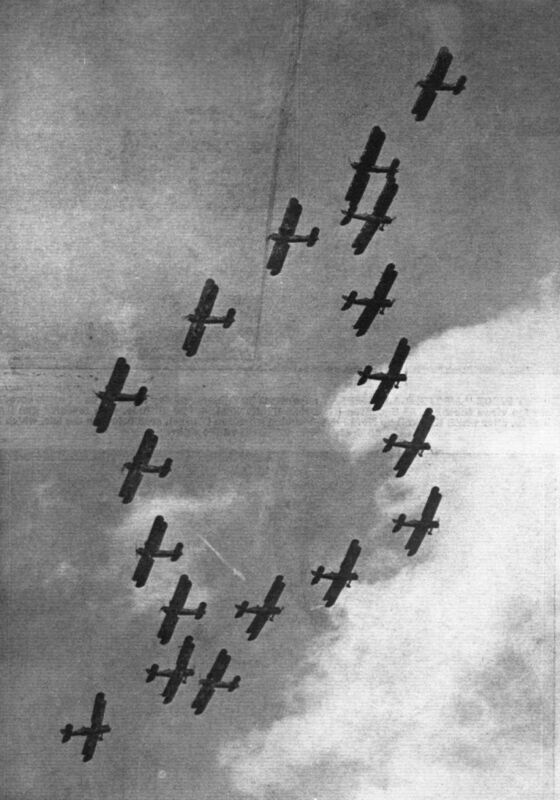 A FINE FORMATION: Were each of the two day-bombing squadrons, in "Squadron" formation, pass over each other and produce a wonderful pattern. "A DRESS REHEARSAL": Some D.H.9a's of No.39 Bombing Squadron carrying out evolutions over Hendon. 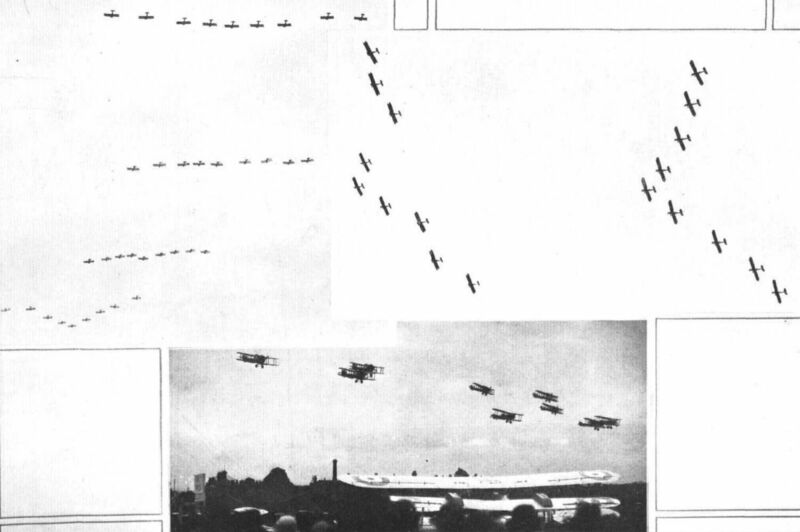 Note the formation of Fairey "Fawns" in the left-hand corner of the top picture. THE "SET PIECE" AT THE R.A.F. DISPLAY: An attack by fighters and day bomber on a hostile aerodrome. The views show No. 12 day-bombing squadron (Fawns), seen on the left, which blows up the hangars, as shown on the right. 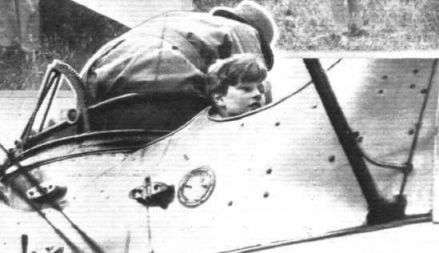 THE MARCHIONESS OF TOWNSHEND'S AERIAL FETE: The young Marquis of Townshend seen here, a little too short for the Fairey "Fawn," cockpit. The Fairey Amphibian "Pintail," Mark III, 450 h.p. Napier "Lion" Engine. A MODERN FAIREY SEAPLANE: A side view of the Fairey "Pintail" Mark IV two-seater fighter seaplane, fitted with a Napier "Lion" engine.